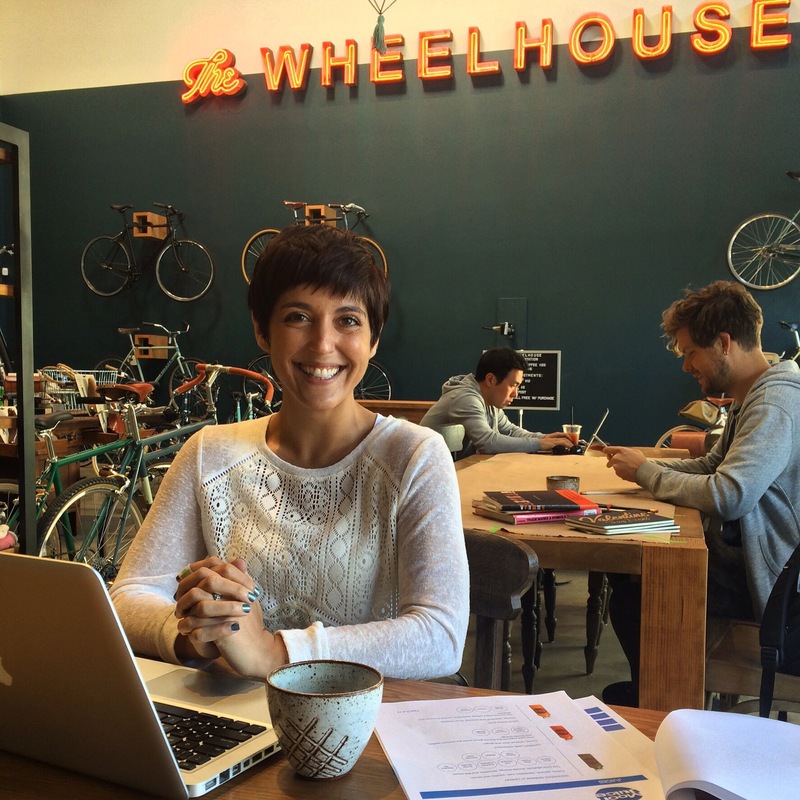 Women + Bikes + Coffee – WeLove2Bike! Saturday morning a group of six women met for coffee, but this was no ordinary coffee gathering. We knew this was the beginning of something. 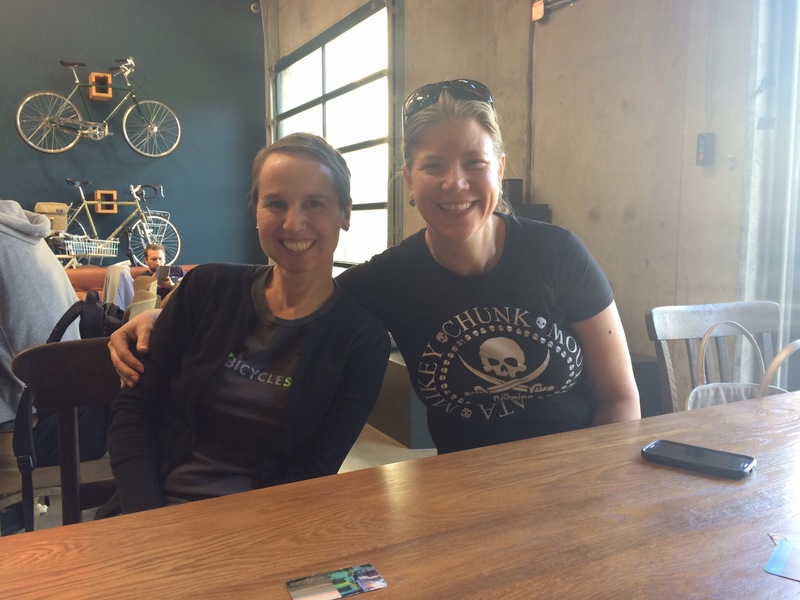 What is it about women who share a love of bicycling that makes it feel so special when we get together? I have loved following the facebook group “Women & Bicycles”, created and curated by the Washington Area Bicyclist Association (WABA). The WABA group now has 4,781 members and recently changed its name to “Women & Bicycles: Washington DC Region”, perhaps to clarify that it is focused on the DC region. But I am not the only outsider who follows the group. Their discussions of all things bike-related, in the confines of a group open only to women, are the best. I get great tips from that group on gear, city cycling etiquette, you name it. I also like staying in the know on what’s happening in DC, as sometimes they have an event going on while I will be out there on business. As I’ve shared in my coffeeneuring posts on this blog, I have attended a few of their coffee meet ups. Which brings me back to Saturday. It started when I saw a post in the Women & Bicycles group from someone who was going to be in Los Angeles on business for a couple of weeks, and she was wondering if anyone knew of a coffee group meet up while she was here. I told her we don’t have a coffee group, but we can start one now! I knew just the place to propose for our first coffee meeting. I have been following a new coffee shop on social media for the last several months, and have wanted to pay them a visit. 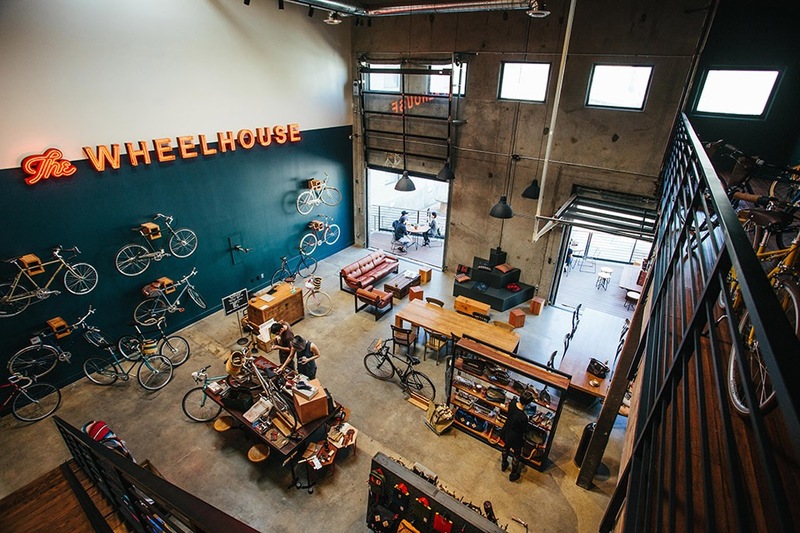 It’s called The Wheelhouse, and all I really knew about it was that it was a coffee shop in the arts district and had a bike theme to it, which of course was plenty to motivate me to check it out. So I created a facebook event for 9am Saturday at The Wheelhouse and started inviting women. I also contacted The Wheelhouse to let them know we would be meeting there and got a wonderful reply from Tami, the owner. I rode the 5 miles to The Wheelhouse early, wanting to be sure I got there well ahead of the others so I could check the place out. It really is in the warehouse zone. The address is on 6th street, just east of the fashion district and produce row, but you can’t see it from the street. There are signs to guide you, but it’s sort of in the middle between 6th & Factory Place, maybe a little closer to Factory Place. 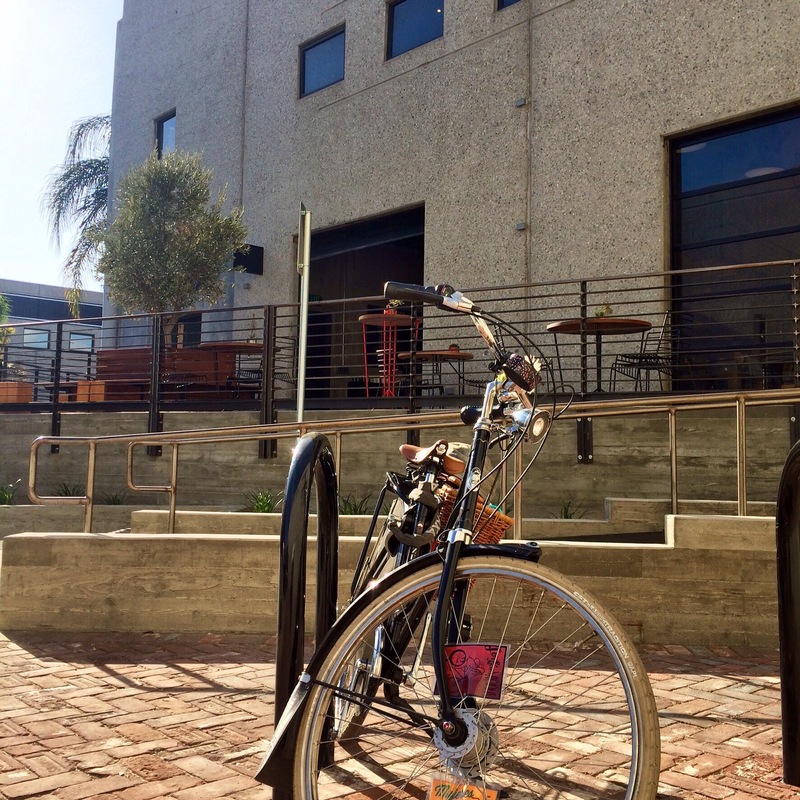 Of course, there’s bike parking out front, so I locked up my Gazelle and walked up the ramp to go inside. Parking for bikes (& cars) in front of The Wheelhouse. A ramp makes it easy to bring your bike inside. What a treat for the eyes! The shop is beautifully designed. It really is a coffee shop and a bike shop, as in: you can buy a bike, buy gear for your bike, and/or get your bike serviced, and have coffee while you wait. There’s a sign by the repair stand offering an espresso & flat repair for $20 – great idea. 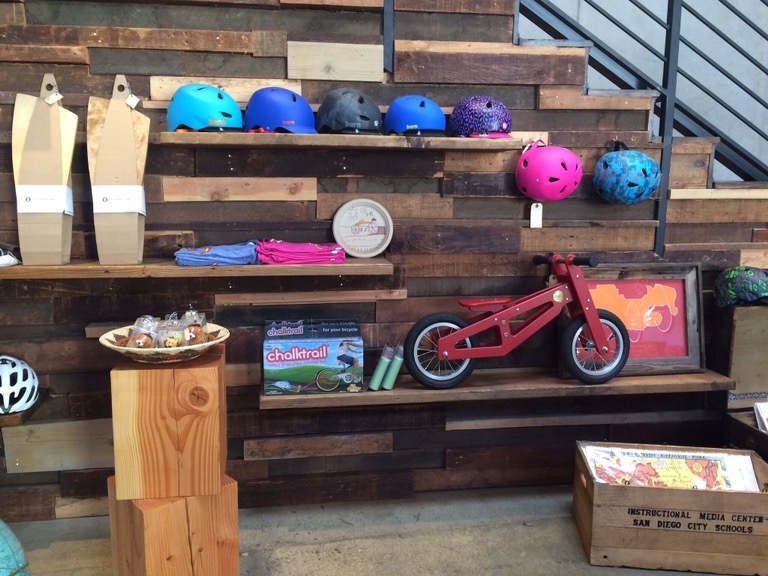 Lots of fun & colorful bike gear, for every kind of rider. The space is wonderfully inviting. There are two large tables that are great for groups and/or for folks needing a work space. There’s a more casual & comfy couch area, a less comfy but cool-looking seating area, and some tables and chairs out on the deck. 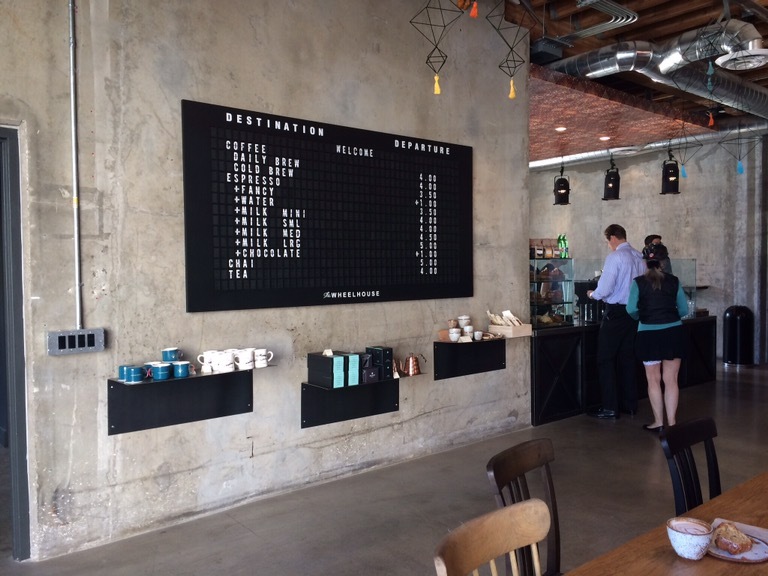 Another design element I loved was the menu board, which looks like an old-fashioned train depot schedule. The best design feature of all, though, is the variety of bikes, all painted black, but ranging from cruiser to road bike to folder, emerging from a concrete wall. The menu reads like a train schedule. I ordered a mocha and an almond croissant, both of which turned out to be excellent, and sat at one of the big tables, where Tami was working at her laptop. I learned that Tami is responsible for all of these beautiful design features – interior design being one of her specialties. I enjoyed hearing her story: Tami came to L.A. from Chicago, where she lived car-free and enjoyed getting around by walking. She initially settled in West Hollywood, which she loved for its walkability and how, being out on the sidewalks, made you feel so much more like a part of the city. Later, when she met Chase, now her husband and business partner, he was in downtown L.A., and found biking worked well for him there. When she and Chase met, she was very into coffee, and he was very into bikes, and they shared their passions with each other. He helped her find her way to get comfortable biking in L.A., and fixed up a vintage bike for her, which bike is now on display in the shop. 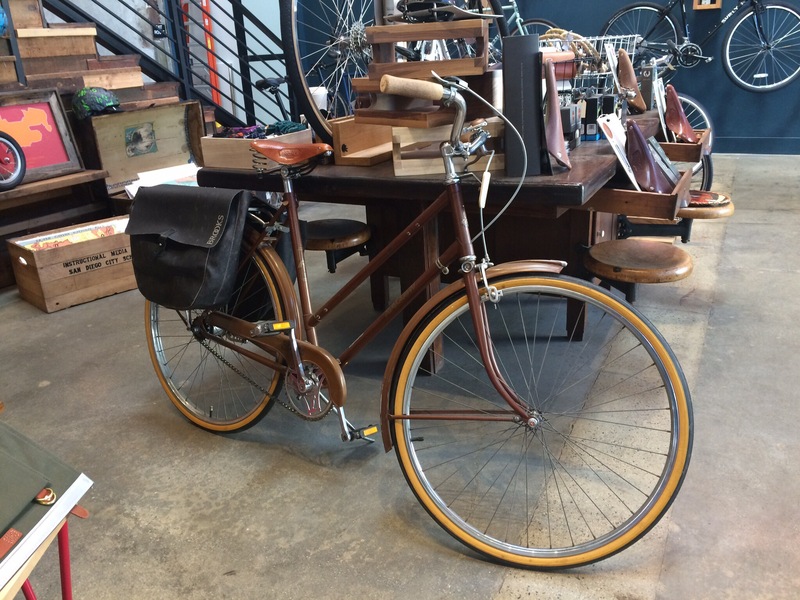 Tami’s vintage bike, on display in the shop. Tami noticed that the local bike shops were not very oriented to city riding. Instead, the bike culture here seemed focused on road biking out on places like PCH and Mulholland. Tami told me the shop reflects their combined passions for coffee and bicycles, and a mission to foster community and to inspire people who might not relate to the road bikes or mountain bikes on display at other bike shops. This is a place where the bike-curious can discover a bike that expresses their own personal style. In this collaboration, her husband, she says, is the bike person, and she is the coffee & pastries person. Tami Spenst co-owns The Wheelhouse with her husband, Chase. Her interior design skills are on display. Soon enough, other women began to arrive. I knew all too well that the flake-rate can be high for an event like this, where group camaraderie has yet to be created, so it was a relief to see that it wouldn’t be just me. We ended up with six women total, two of whom were visiting from DC and are regulars of the coffee club out there. It turns out our second DC guest happens to be from the L.A. area, and just happened to be in town this weekend for her sister’s birthday celebration. 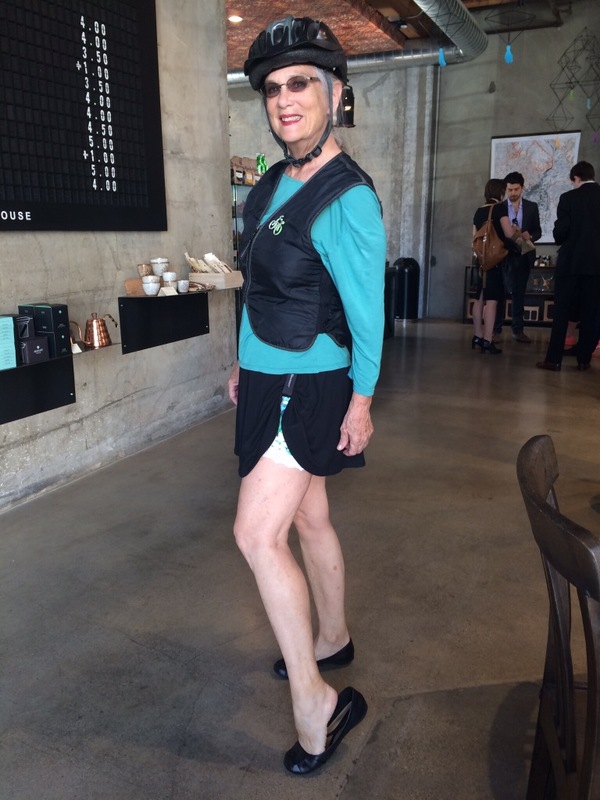 Jennifer showed up beautifully styled in her Bikie Girl Bloomers Hitchable Flounce Skirt & Crazy Daisy Pettipants. Liz & Kristi, representing the DC Women & Bicycles Coffee Club. We chatted for two hours, discovering common interests and sharing news of upcoming events. It became quite evident that this could not be just a one-off thing. We knew right then and there that (1) we need to have more coffee gatherings, and (2) we need to form our own Women & Bicycles group for Los Angeles. That very day, I started our new facebook group and invited all the local bicycling women I could think of. 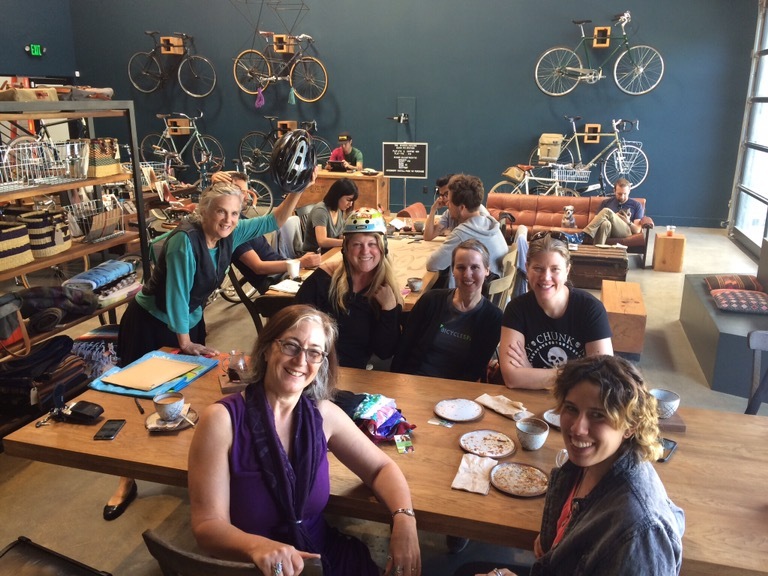 Women & Bicycles Coffee Club, L.A. style. Some of us are planning to participate in the Los Angeles County Bicycle Coalition‘s next Sunday Funday ride on May 1st in Northeast L.A. Care to join us? Check out our group page here (you can request to join – we will keep the group closed to ensure it stays a women’s group). I’m a brand-spankin’ new cyclist in LA and this has been a wonderful morning! I found your online store, then your blog, and now your FB group. Great meetup and wonderful idea. Hoorah! That’s great, Cyn! I hope to meet you at our next coffee gathering. I’m thinking about having one this weekend, or maybe on Monday, since it’s a holiday. 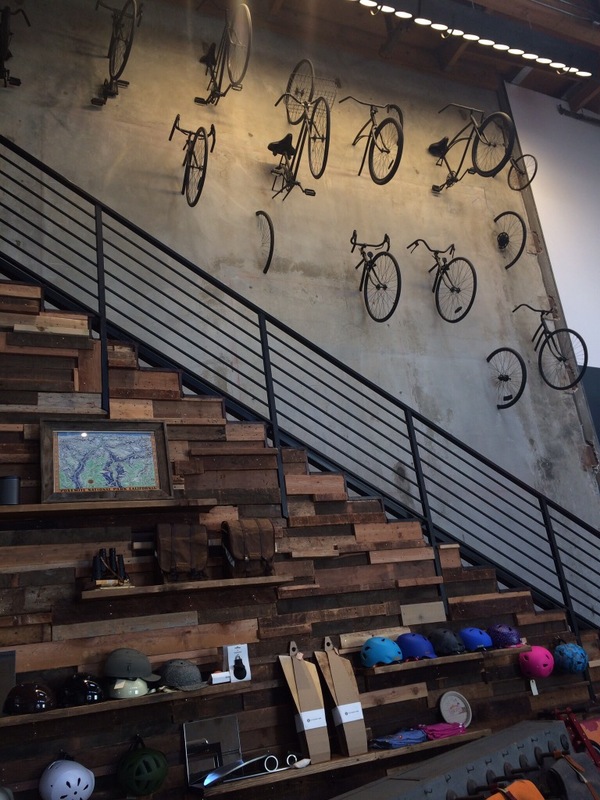 Pingback: Coffeeneuring 2016-1.0: Downtown L.A. | WeLove2Bike!